Magic Eye Infinity Stereogram is a pretty cool one, I used to love magic eye books as a kid i will have to dig them up some time and scan some of the better ones for you guys. 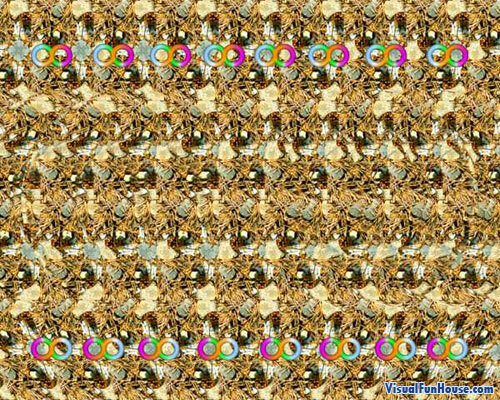 This Magic Eye stereogram is of the Infinity symbol. It poped out pretty quick for me. If you have never done these before there is two tricks. One make your eyes slowly go crosseyed and it should jump out at your (works almost instantly for me) . The second method is to go close to the screen stare into the center and slowly move away. If you stare at it close up the infinity symbol floats. But if you stare at it from a distance a mold of the infinity symbol pops up and floats above the original. I got it the 1st time i looked at it. 1st get right up at the picture then when its gone all blurry and your eyes are relaxed you start to move away and you see what it is.